“Sunshine and Shadow” quilts originated with the Amish as a beautiful reminder of the equilibrium of life. It’s a reminder we can all use on a daily basis! Bring a little light and balance into your home with this sparkling, modern kaleidoscope of color. Create your own My Sunshine quilt with Denyse’s Modern Solid Pre-cut 10-inch Charm Pack from FreeSpirit Fabric. The charm pack includes 75 pre-cut solids, and one pack will make up to a king size! You’ll need additional yardage of the background colors (as shown: FreeSpirit Designer Solids in Mist, Shell, and Chamois). Share your creations on social media: #IamaFreeSpirit, #ModernSolidsFabric! 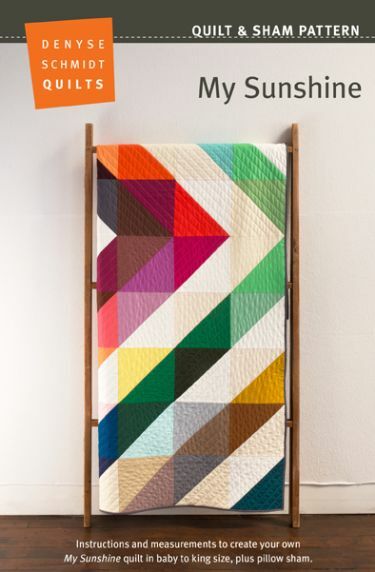 All DSQ patterns includes: easy-to-use instructions and measurements to create quilts in baby, twin, queen, or king, and pillow sham. Order the paper pattern with the yellow button! $15.95, plus shipping.